Both conceptual artists, Susan Elder and Craig Dennis arrived at photography as a way to examine science and perceptual bias. Their work often has a pop art sensibility and resulting humor, as well as an "age of discovery" exploration of the natural world. While each of us has a separate, productive history of artistic accomplishment, we have collaborated formally since 2001, sharing all aspects of the art-making process. Every project begins with a concept that engages both of us equally — despite our differing approaches and affinities — and which offers the potential to become more than it would be if created by either of us alone. Recording uncanny instances of common subjects allows our work to reveal content-rich terrain available to the patient and discerning eye. We enjoy reshaping instinctive ways of seeing. While our approach relies on the camera’s accepted faithfulness of representation, we try to turn that documentary premise on itself by releasing unexpected imagery from mundane things. A new series of photographs by the collaborative team Susan Eder/Craig Dennis is featured in the gallery's current exhibition. In addition to their collaborations which have been ongoing since 2001, each artist works independently. This exhibition also includes two new series by Susan Eder. Susan Eder and Craig Dennis have often described their collaborative work as follows: "We are intrigued by the gap between representation and abstraction and often operate at the very fulcrum on which images pivot from one mode into the other. Our work pursues the underlying perceptual and cultural mechanisms by which pure abstraction starts to represent, and the recognizable is transmuted into new meanings." Their new series is titled "Hide & Seek". 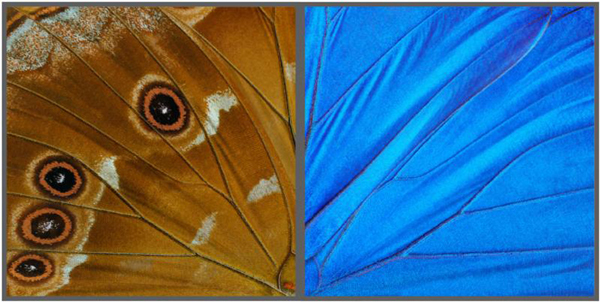 Here the artists have paired "photographs of two extremely close-up, greatly enlarged views of the top and bottom sides of a butterfly's overlapped wings. By focusing on pattern and coloring-camouflage for hiding and vivid color for seeking a mate- the piece alludes to broader concepts of duality, deception and adaptability." Biological mutations have fascinated Susan Eder for many years. In her two new series, she presents mutations she has found in clovers and orchids. "Clovers with more than three leaves are mutations resulting from environmental and genetic causes, occurring approximately once for every 10,000-20,000 normal specimens. They are reproductive errors.....yet have been considered fortuitous for millennia." The images in this exhibition include 4, 5 and 6 leaf clovers that the artist has collected and photographed over a number of years. 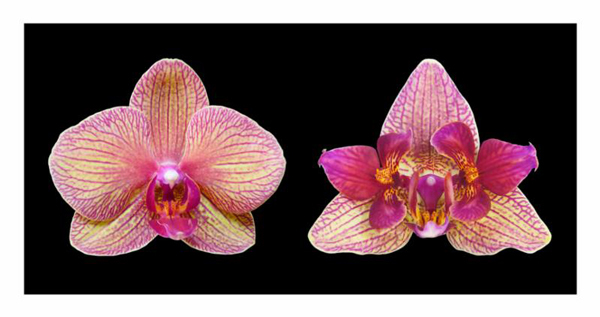 Susan Eder's orchid series focuses on comparisons of normal and peloric blossoms of the same variety. These variations in structure and color occasionally occur in the wild, but are much more common in genetically manipulated and cloned orchids grown for the mass market. The comparisons are greatly enlarged and dramatically presented in these new photographs. All the photographs in this exhibition are LightJet prints in small editions. The printing process uses laser light to project high-resolution images on photo-sensitive paper, preserving maximum detail and luminosity. Susan Eder and Craig Dennis emphasize that they do not alter or fabricate the actual subject matter of their photographs which are all taken directly from nature. Susan Eder and Craig Dennis met during their first week of art school at the University of Michigan, married four years later, attended grad school at Ohio State University, and have been collaborating ever since. They spent eleven years in academia. Craig taught all aspects of studio fine arts at Colgate University and Williams College, while Susan taught fine art, graphic design, and calligraphy at SUNY Morrisville and North Adams (Massachusetts) State College. In 1985 they opened a graphic design business, Arts & Letters, Ltd., in Falls Church, VA. While continuing their individual art practices, their artistic collaboration began in 2001. Born in St. Louis, MO, Susan was raised in a family of artists and musicians who prioritized creative expression and constant access to art materials, museum visits and private lessons. By age two, she knew she would be an artist, eventually earning her BFA in printmaking and ceramics and her MFA degree in sculpture and drawing. Eder’s content-oriented approach to photography was influenced early on by conceptual art; while living in Hamilton, NY, in the mid-1970s, her friends included structuralist film-maker Hollis Frampton, photographer Marion Faller and new-media artist Patrick Clancy. An impulse to collage an old vacation snapshot into a drawing led her to carry a small camera with her; the photos she took generated series that left drawing behind and explored the oddities of everyday life. Described by one critic as “less a documentarist than a kind of freewheeling social philosopher with a camera,”* Eder uses gentle interventions and curious juxtapositions to uncover the metaphoric power lurking in everyday objects. Growing up in Lansing, Michigan during the depths of the Cold War, the arts always took a backseat to my more serious scientific, academic pursuits. While art was my first love, it was not considered as noble as rocket science. That was where you found true genius. As I matured and conversed with my colleagues in the hard sciences, I found that their pursuits were really all about the same theorizing, experimenting and pattern recognition that artists confront on a daily basis. I finally realized that art is the birthplace of new ideas. It challenges us to perceive our existence in fresh and unusual ways. That’s where I wanted to be. All my artistic efforts since, while giving a nod to the rigid scientific methods I first learned in the lab, have always been tempered with the poetry of "what if." Artistic collaborators Susan Eder and Craig Dennis specialize in near-abstract patterns, but they don't make them. The Northern Virginia photographers find them in nature — gazing at clouds, bananas or other commonplace things through a macro lens. The diptychs in "Hide & Seek," their show at Marsha Mateyka Gallery, look at butterflies from both sides. 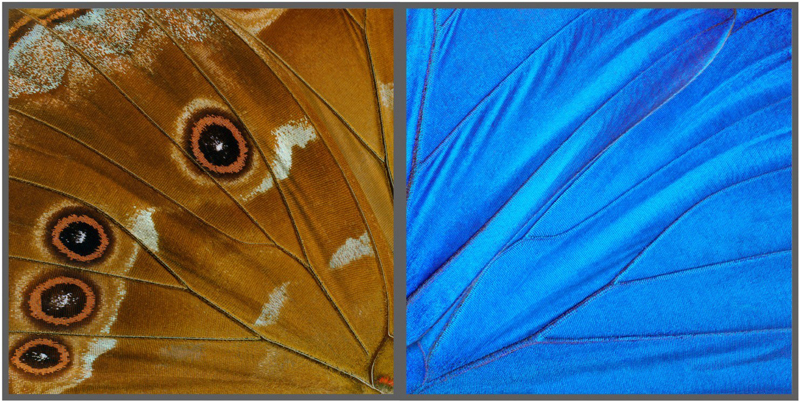 The two-panel pictures contrast the undersides of the insects' wings, which feature mottled browns and eye-shaped ovals as camouflage, with tops of silky blue or red. The vividly single-hued wings are used to attract mates, but when photographed and enlarged dramatically, they resemble color-field paintings. Eder also does solo work, such as the "Mutations" the gallery is showing. One set depicts four-, five- and six-leaf clovers, each biological curiosity endowed with authenticity by such little flaws as small holes and brown spots. The clovers are shown in glass vessels, while Eder arrays orchids in front of black backdrops, highlighting their voluptuous pinkness. Aside from arranging them in pairs or groups, Eder doesn't manipulate the orchid images. Four-leaf clovers are natural phenomena, but the most unusual orchids (called peloric mutations) result from cloning or genetic alteration. Magnified and isolated, they are both beautiful and bizarre. Eder simply observes, but the greenhouse alchemists who beget such blooms engage in strange magic. Susan Eder et Craig Dennis forment un couple et oeuvrent ensemble depuis 2001 à l'élaboration de photos originales qui dépeignent le plus souvent des situations entre l'abstraction et le figuration. Leur travail explore l'universalité de l'esprit humain pour en discerner les différentes perspectives et même solliciter des émotions produites par des phénomènes naturels. La série entitulée The Popcorn met en forme des expressions inespérées de graines soufflées, ni modifiées, ni retouchées. Les illustrations d'Eder et Dennis sont publiées sur le site ederdennis.com. Leurs photos en édition limitée, appartenant à de nombreaux propriétaires publics comme privés, sont disponibles à la galerie Marsha Mateyka, située dans la capitale étatsunienne, Washington. marshamateykagallery.com. The standard histories of the development of language portray the move from symbolic representation—you signal "snake" by drawing one—to abstract representation (the letters "s-n-a-k-e") as a central breakthrough. The versatility of language systems gives them the ability to represent, however poorly, our senses, perceptions and even ideas. But language itself is a representation, as the nine artists in Letters, Words, and Phrases are all too eager to remind us. Collecting sculptors, photographers, printmakers, and mixed-media artists, the show imagines the potential of language to evoke more than itself, to make letters pictures once again. Sept. 7 – Oct. 1, 2005, The Marsha Mateyka Gallery, Washington, D.C.
Photographing clouds may not be the most original pursuit, but the work of Susan Eder and Craig Dennis is sui generis. Over the years, the two have documented clouds that look like letters and numbers—one for every letter and digit, plus punctuation marks, right down to the semicolon. Their works, showing through today at the Marsha Mateyka Gallery, combine elements of the artists' alphanumeric collection in witty ways: an eye chart, a cinematic frame reading "THE END," a mathematical "magic square" matrix, and even a typographical chart for the winkingly named "New Cloud Roman" font. (A second series documents the unexpected patterns visible in slices of cinnamon-swirl bread.) A few of the duo's cloud works reach for grander meaning—one spells out "God" in dozens of languages, playing off the heavenly imagery—but even without the intellectual spin, the artists' dreamy blue tones, plus the knowledge of how difficult it was to bring the series to fruition, are reward enough. The show is on view from 11 a.m. to 5 p.m. (to Oct. 1) at the Marsha Mateyka Gallery, 2012 R St. NW. Free. (202) 328-0088. Without background information, much of the work here remains oblique. Fortunately, wall labels are on hand to guide you through the show. For instance, we learn that close-up photographs of popcorn kernels by Susan Eder and Craig Dennis "combine detailed observation with deadpan humor to project human or animal traits onto objects with only a minimum of cues." Susan Eder calls herself "a conceptual artist who uses photography," not "a photographer" She and her collaborator/husband Craig Dennis, in what seems a parody of scientific research, choose to document mundane, non-art things like clouds, exquisitely lit banana slices and popped corn. They know that viewers, confronted by objects in series, tend to "read in" personalities and perceive human faces. For Snowmen, an edition of 19 chromogenic prints, Eder set out with her camera across wintry landscapes of Virginia's Fairfax and Arlington counties. "Every eight-year-old makes a snowman," she says. "Snow must have been used for the earliest effigies." She knocked on doors and asked permission to shoot each icy figure (from a sports fan in shades, above, to a Goth), all marked by ingenuity — a hot dog nose, Oreo cookie eyes. Just in case some sculptor might later cry foul, Eder talked to art lawyers. "They felt I was O.K. It seems ice sculpture can't be copyrighted, because it melts." She's delighted that Marsha Mateyka Gallery (page 20) recently sold three snowmen images to the State Department for the U.S. embassy in Uzbekistan. "It's a country in political turmoil. My snowmen may bring smiles to their faces." ...Eder's unwavering stance before the human face speaks of her long journey as a visual archaeologist. She sees the camera as a tool to craft works of inquiry and revelation. Photographs are merely Eder's starting point, and one of her great strengths is her ability to unearth small truths and from them create artworks that are startlingly beautiful and loaded with painstaking perceptions. ...The most poignant works in the Frames of Reference series are a trio of paired frames entitled "Me Through My Father's, Mother's and Husband's Glasses." These photographs present six versions of the artist's face, through the lenses of three people who love her. The resulting distortions are uncanny. Through her father's glasses, she appears as both angel and imp; through her mother's, she is younger, rounder, and blurred just enough to be unknowable. One photographer is interested in documenting what, where, and especially when we see, as we contemplate the world around us; the other is more curious about how we see. And exactly who sees what. These are very different approaches, and yet each is concerned with the personal landscape of the camera lens and its solemn pledge to tell a truth. But photography is a cosmic trompe l'oeil, a trick of the eye, even when it is behaving as anticipated. For those who doubt that we create "reality," Susan Eder's photographs are a salutary corrective. Her vivid and disturbing works disguise their challenges to certainty in such complex visceral and visual juxtapositions, however, that thoughtful viewers soon long for the relatively tranquil shores of simple paradox. But Eder's work is never simple, although it often appears straightforward. And while she seems to be looking carefully at objects, images and creatures any citizen might encounter, her gaze is not merely the trained eye of the artist, but more like the paralyzing stare of the basilisk. In many of her earlier photographic works, Susan Eder plays one system of meaning off against another. This tactic has been familiar in art since Duchamp's Ready-mades, in which the formal qualities of common objects are ironically contrasted with their mundane functions. Eder's pieces too are humorous and heady. ...Eder treats natural phenomena — clouds, leaves — according to various systems of analysis and ordering. In each piece of her "Ghost Images" series of 1976-79, for example, she juxtaposes two postage-stamp-size color photographs, one of an animal, bird or fish, and the other of a cloud having exactly the same shape. At first it may seem that Eder is attempting to deflate the romantic metaphors layered onto natural phenomena. Where Alfred Stieglitz tried to find "Equivalents" for ineffable emotions in clouds, Eder pins them down with abstract logical systems. But in fact her comparisons cut both ways. Not only assumptions about nature, but notions of representation and signification in general — the other element in Eder's juxtapositions — are challenged as arbitrary. In fact Eder remains if anything a closet romantic, championing the poetic logic of "nature" against the culturally determined logic of sign systems. ...In a final group Eder juxtaposes before-and-after photographs of objects that she slices through to form cross-sections. Some of the objects are variations of those in her other work — a blue origami bird, a knot in a gold-sheathed cord or in a rep tie — while some are new: a pink hyacinth, a small cactus. The resulting sectional views have none of the pristine clarity of draftmen's abstracted renderings; they're photographs, not drawings. And so they tell more about the desire to understand structure than about the specific structures being considered.